The new smart composite material, developed by researchers at the University of Wollongong's (UOW) Faculty of Engineering and Information Sciences, shows properties that have not previously been observed: it increases in electrical conductivity as it is deformed, especially when elongated. Elastic materials, such as rubbers, are sought after in robotics and wearable technology because they are inherently flexible, and can be easily modified to suit a particular need. To make them electrically conductive, a conductive filler, such as iron particles, is added to form a composite material. The challenge for researchers has been finding a combination of materials to produce a composite that overcomes the competing functions of flexibility and conductivity. Typically, as a composite material is stretched, its ability to conduct electricity decreases as the conductive filler particles separate. Yet, for the emerging sphere of robotics and wearable devices, being able to be bent, compressed, stretched or twisted while retaining conductivity is a vital requirement. 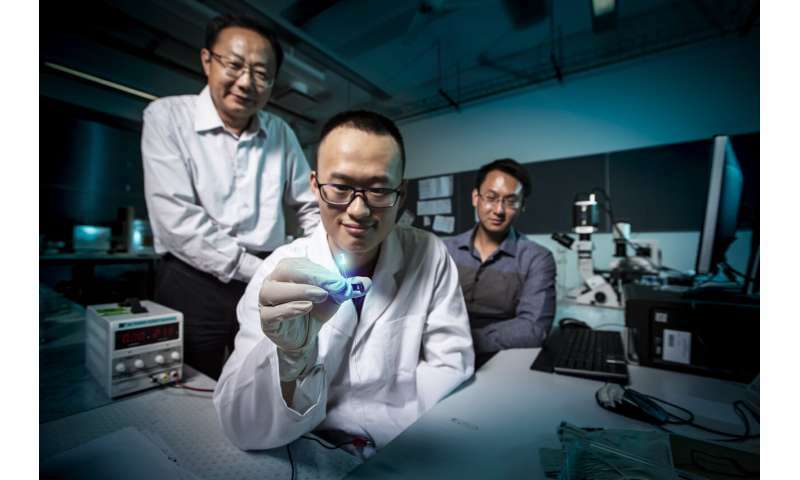 Led by Senior Professor Weihua Li and Vice-Chancellor's Postdoctoral Fellow Dr. Shiyang Tang, the UOW researchers have developed a material that throws out the rule book on the relationship between mechanical strain and electrical conductivity. 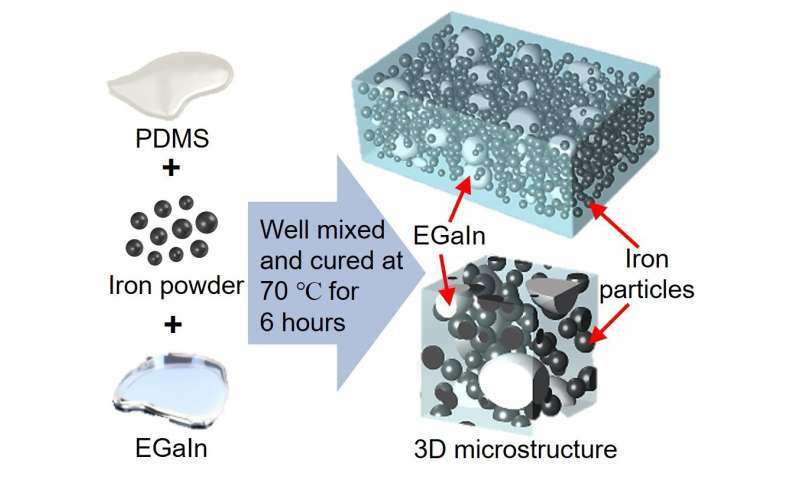 Using liquid metal and metallic microparticles as a conductive filler, they discovered a composite that increases its conductivity the more strain placed on it – a discovery that not only opens up new possibilities in applications, it also came about in an unexpected way. Dr. Tang said the first step was a mixture of liquid metal, iron microparticles, and elastomer that, by a fortuitous accident, had been cured in an oven for much longer than normal. The over-cured material had reduced electrical resistance when subjected to a magnetic field, but it took dozens more samples to find that the reason for the phenomena was an extended curing time of several hours longer than it would normally take. "When we accidentally stretched a sample while we were measuring its resistance, we surprisingly found that the resistance reduced dramatically," Dr. Tang said. "Our thorough testing showed the resistivity of this new composite could drop by seven orders of magnitude when stretched or compressed, even by a small amount. "The increase in conductivity when the material is deformed or a magnetic field is applied are properties we believe are unprecedented." The results were published recently in the journal Nature Communications. Lead author and Ph.D. student Guolin Yun said the researchers demonstrated several interesting applications such as exploiting the composite's superior thermal conductivity to build a portable heater that warms where pressure is applied. "The heat increases to the area where pressure is applied and reduces when it's removed. This feature could be used for flexible or wearable heating devices, such as heated insoles," he said. The research group has been studying materials that can change their physical state, such as shape or hardness, in response to mechanical pressure. With the addition of electrical conductivity, the materials become 'smart' by being able to convert mechanical forces into electronic signals. Professor Li said the discovery had not only overcome the key challenge of finding a flexible and highly conductive composite material, its unprecedented electrical properties could lead to innovative applications, such as stretchable sensors or flexible wearable devices that can recognise human motion. "When using conventional conductive composites in flexible electronics, the decrease in conductivity upon stretching is undesirable because it can significantly affect the performance of these devices and compromise battery life. "In this sense, we had to develop a composite material with properties that have never been observed before: a material that can retain its conductivity, or increases in conductivity, as it is elongated. "We know that many scientific advances have come from unusual ideas. The exploration of unconventional fields and a lab culture that encourages innovation is more likely to bring unexpected discoveries."